ePublishing Knowledge BaseePublishing Knowledge BaseePublishing Knowledge Base Creating and Managing EventsHow do I change the order of custom event details? To reorder the event details that appear on the Event Manager > Custom subform for a specific type of event, follow the steps in this article. 1. Go to your Taxonomy Manager. 2.1. After clicking the + sign next to Events, your options will open up. 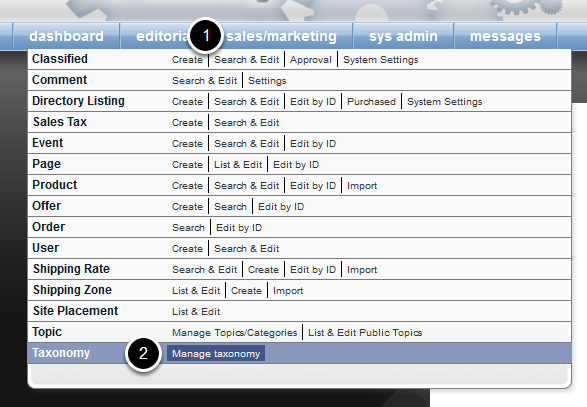 This step is to help you identify which event type you'd like to update. 3. After identifying the event type you'd like to update, leave the Taxonomy Manager and go to Sys Admin > Event Details and click List & Edit. 4. Select the Classification event type you wish to update by clicking the box next to the name. 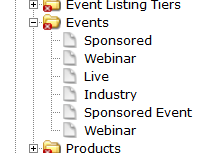 That event type name will then move up above the list to show that it has been selected, as shown below. 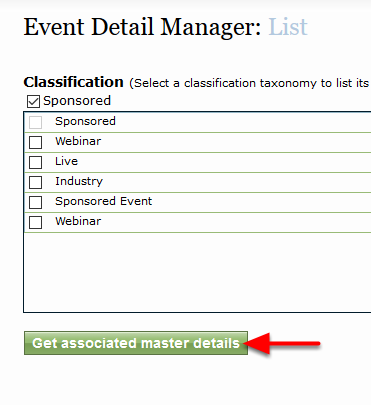 Zoom: Select the Classification event type you wish to update by clicking the box next to the name. 6. As long as the event detail already exists and just needs to be re-ordered, select the icon to the left of the detail to be moved and drag it to the new location in the list. 7. Your update will be automatically saved. Close out of the Event Detail Manager by clicking the X at the top right of the screen. Zoom: Your update will be automatically saved. Close out of the Event Detail Manager by clicking the X at the top right of the screen. 8. Go to an event of the type you have updated and review the order change on your website. Questions? Ask your solutions manager. Prev: How do I market to event registrants? Next: How do I review the list of attendees who have registered for an event?